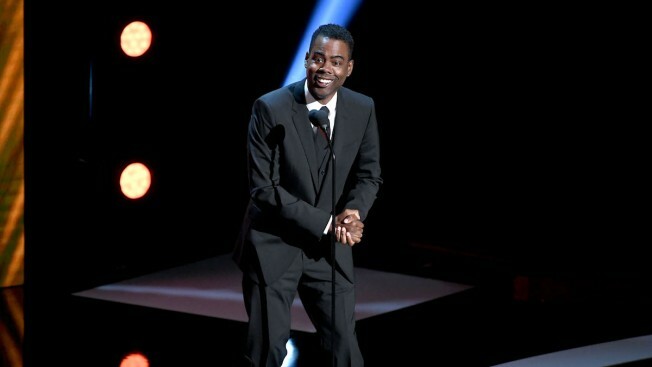 Chris Rock onstage at the 50th NAACP Image Awards at Dolby Theatre on March 30, 2019 in Hollywood, California. Chris Rock dissed Jussie Smollett onstage at the 2019 NAACP Image Awards on Saturday night. Rock presented the Outstanding Comedy Series award at the show at the Dolby Theater, but before leading into the nominees and announcing the winner, he said he was not allowed to speak about the "Empire" star but defied the rules. "I get to present an award. They said no Jussie Smollett jokes," he began. "I know. I know. What a waste of light skin. You know? You know what I could do with that light skin? That curly hair? My career would have out of here. Running Hollywood." Rock continued after some laughter, "What the hell was he thinking? You Jesse from now on. You don't even get the 'U' no more. That 'U' was respect." He finished off, "You ain't getting no respect from me." Smollett was nominated for an NAACP Image Award in the Outstanding Supporting Actor in a Drama Series category. That award was given out at a dinner on Friday night, but the Empire actor did not attend and ultimately lost to Grey's Anatomy's Jesse Williams. Smollett has been at the center of conversations in Hollywood and around the world as his Jan. 29 attack investigation took turn after turn. He claimed he was a victim of an alleged racially motivated crime in Chicago, but then Chicago Police "shifted the trajectory of the investigation" and Smollett officially became a suspect in his own case. The 36-year-old actor turned himself in on Feb. 21, and he was indicted on 16 counts by a grand jury on March 8. On Tuesday, the Smollett investigation took yet another major shift when Chicago prosecutors announced they were dropping all charges against the actor. His attorneys praised the decision in a statement made that day. "Jussie and many others were hurt by these unfair and unwarranted actions. This entire situation is a reminder that there should never be an attempt to prove a case in the court of public opinion. That is wrong," his lawyers Tina Glandian and Patricia Brown Holmes wrote. "It is a reminder that a victim, in this case Jussie, deserves dignity and respect. Dismissal of charges against the victim in this case was the only just result." The attorneys said the actor is "relieved to have this situation behind him and is very much looking forward to getting back to focusing on his family, friends and career." The Cook County State's Attorney's office told E! News why they dropped the charges against him. "After reviewing all of the facts and circumstances of the case, including Mr. Smollet's volunteer service in the community and agreement to forfeit his bond to the City of Chicago, we believe this outcome is a just disposition and appropriate resolution to this case." Smollett thanked his family and friends in a press conference after the news broke. "No one will ever know how much that has meant to me and I will forever be grateful. I want you to know that not for a moment was it in vain," he said. "I've been truthful and consistent on every single level since day one. I would not be my mother's son if I was capable of doing one drop of what I was accused of." Smollett called the recent months "an incredibly difficult time" and "one of the worst in my entire life." He finished the press conference with some hope for his future and plans ahead. He said, "Now I would like nothing more than to get back to work and move on with my life but make no mistakes I will always continue to fight for the justice, equality and betterment of marginalized people everywhere."